​Welcome to Scout and About dog walking services! This is my human’s new company. Her name’s Kirsty and she loves all dogs and animals! She really enjoys walking me everyday, and sometimes my friends. So much so, she thought she would help out lots of other dogs whose human’s have to leave them at home when they go to work. We go on lots of nice walks, in all weathers (except when it’s really hot) to exciting places like the local fields, the woods, and sometimes the park. 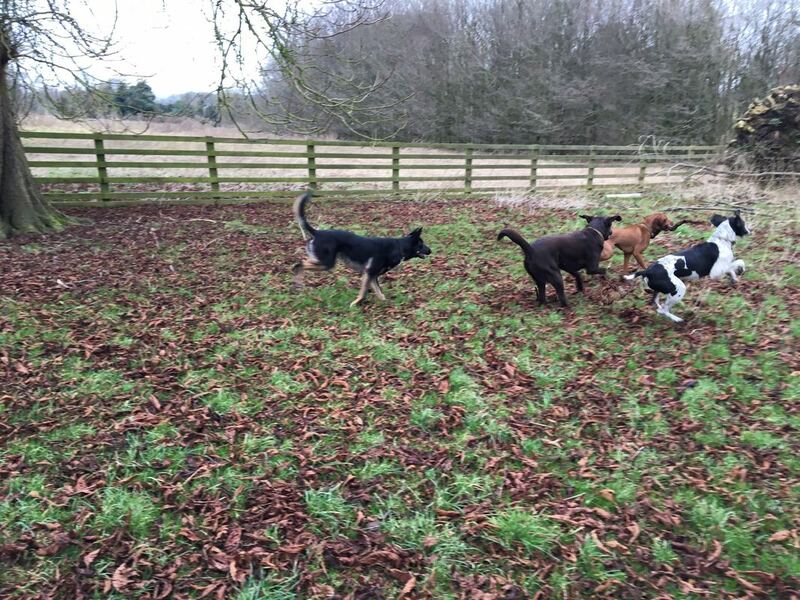 We always get to have a good sniff around and a run off the lead if everyone promises to come back for a treat! I love it when we get to run and play chase! When we get home, my human gives us fresh water, some treats, and lots of fuss, and then we usually fall sleep from all the playing! If you think you would like to come “Scout and about’ with us, get your human to call my human, and I’ll see you soon! Me and some of my playmates!